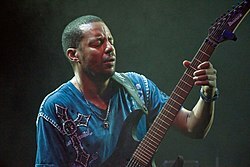 Tony MacAlpine (born August 29, 1960) is an American musician and composer. In a career spanning three decades and eleven studio albums, he is best known as an instrumental rock solo guitarist, although he has worked with many different bands and musicians in guest appearances and collaborations. Having started playing piano at the age of five] and guitar at twelve, MacAlpine studied classical music for a number of years at the Springfield Conservatory of Music in Massachusetts, as well as various music programs at the University of Hartford in Connecticut. One of his musical influences is Frédéric Chopin, to whom he pays homage in his interpretations of the latter’s études, which are featured on the majority of his studio albums. Klik hier voor meer informatie.